Best and most durable relay I have worked with. Relay wires were not to thin like most relays out there connection worked great and just to know that everything was protected and heat shirked was great. Thanks sonic for another great buy. I will continue to buy from you guys. Well made & free of charge. It was included free of charge as part of my HID kit but not required on my 99 A4 so it wasn't used. The harness is well made and looks like it would last over time. This was just the product i needed to stop my headlights from flashing like disco lights. If you have a dodge charger. You will need this. Easy to install, a must if u install hids on your car. If you have a newer Dodge, you may need to buy this with your race sport HID's otherwise you'll have flickering and your headlights will turn off. I bought two sets h7 and h10 for my highs and fogs. Colors match perfect and car looks cool will recommend . The relays where included for each kit. The bundled package i received (Race Sport Accessories BALLAST-CANBUS-G2(PR), Race Sport Accessories 9006-6K-SB-RB, Race Sport Accessories RELAY-HARNESS) all work wonderfully! Awesome product and easy to install on your own. Only item of concern or preference was length of the relay harness cord could have been a tad longer, but not a bad issue to affect install or use. If you get the ballasts and lights, DEFINITELY worth your money to get the relay harness! Ive had both set ups with and without and with the relay they turn on every time without hesitation. I received this product with a set of Bi-Xenon headlights. 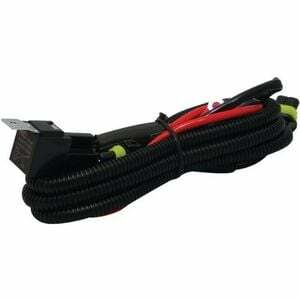 This relay harness is very well made and insulated, requiring very little installation! I would definitely purchase this product again, Sonic Electronix has the best products with unbeatable prices!